Born and raised in Aspen, Colorado. Daughter of Kay and Roy Reid, both strong participants in Aspen’s growth over the years. One of the most difficult places in the United States to become a top equestrian and competitor. Horses she owned could not be successfully wintered in Aspen unless there was indoor facilities — something which did not exist. Had to move south to Tucson and then out west to California and has literally been “on her own” since she was 12 years old. Karin was one of the first competitors to move to the east coast from California as a junior rider. In her riding career Karin has risen to the top in hunter, jumper, equitation and dressage fields, and has a strong background in all western equestrian sport. Jumping trainers included Jonas Irbinskas, Jimmy Kohn, Richard Keller, Ken Nordstrom, Ronnie Mutch, Patricia Heuckeroth and Carl Knee. Karin’s eventual dressage training influences include training with Master Egon von Neindorff; USA Olympians Steffen Peters, Michael Poulin, and Robert Dover; Olympic coach Jean Bemelmans; Scott Hassler and multiple Gold Medal Dutch Dressage Champion Anky van Grunsven. 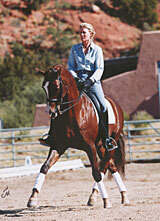 Years later she and her former husband set about developing an equestrian masterpiece in Sedona, Arizona. “El Rojo Grande Ranch” offered trail rides, roping, equine rehab services and authentic stagecoaches were built on the ranch. The property included a park to host special events and weddings. Eventually, Karin became intrigued with the prospect of mastering the art of dressage – the one equestrian discipline she had yet to try. Karin opened “Brek-n-Ridge Farm” in 2010 as a teaching barn in Harbor Springs, Michigan after living overseas for several years to train and compete. Harbor Springs is a small ski town in Northern Michigan. “Brek-n-Ridge Farm boasts Emmet County’s finest indoor riding facility and is home to 30,000 summer and winter residents. “Brek-n-Ridge Farm” is billed as A Beautiful Island Paradise for Horses That You Can Drive To. Throughout her dressage education Karin applied her promotional expertise to advance awareness for and appreciation of dressage by supporting a variety of educational programs and events. Promotion of dressage through her “Offield Farms” sponsorship in Las Vegas for the FEI World Cup Dressage Final in 2005 became a multiple year endeavor. 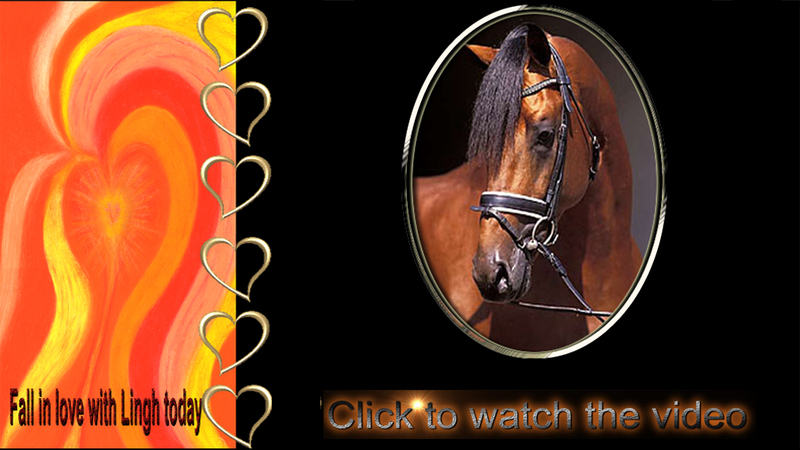 2005, Karin sponsored the World Cup Dressage Finals and her sponsorship enabled national television coverage of the Las Vegas dressage event. 2006, Karin became the proud owner of the world famous dressage stallion Lingh and manages his breeding career around the world. 2007, Karin with Robert Dover successfully acquired national television coverage for the Las Vegas World Cup. 2007, Karin was the Executive Producer for a reality show that aired on Fox Television, The Search For America’s Next Equestrian Star; Dressage, featuring Robert Dover. 2009, Karin and her www.Lingh.nl brand created a “Breeders Meet” in Las Vegas at the World Cup inviting participants from Holland and Sweden to be guests at Harrah’s Casino. 2010, Karin sponsored an international writing contest offering a free breeding opportunity to her stallion Lingh. After hundreds of applicants the winner was published in a September 2010 international publication of “Horse Connection” celebrating The World Equestrian Games in Aachen, Germany. 2010, Karin created the Lingh.nl Dressage Tool Box Symposium and Tool Box Kit and held the first Symposium in Petoskey, Michigan. 2011, Karin and St.GEORG magazine in Germany collaborated on “Win a Ride on Lingh” which resulted in two cover stories and excellent press coverage for her world famous stallion. Karin instructed the winning rider, thirteen-year-old Hannah Allescher from Murnau, Germany. 2009-2013, Karin co-founded the Equestrian Fundraising School, an online school for students to study and participate in fundraising and giving. 2013, Karin partnered with documentary filmmaker Ron Davis and became the Executive Producer of HARRY & SNOWMAN, a heartwarming and inspiring story of animal rescue, compassion, and connection between man and animal. Snowman literally rocketed them both into stardom in just two-short years, in the mid 1950’s as National Champions. 2015, HARRY&SNOWMAN premiered at it’s first film festival in RaleighDurham, North Carolina in April. 2016, HARRY&SNOWMAN was picked up by a theatrical distributor and will open around the United States September 30th, 2016. HARRY & SNOWMAN is a feature length documentary that tells the remarkable life story of international show jumping legend Harry deLeyer, whose career was launched by his famous show jumping horse Snowman. Snowman was an old Amish plow horse that Harry rescued off a truck that was bound for the meat and glue factory for only $80. Less than two years after he rescued Snowman, they rose to become the national show jumping champions and were the Cinderella story and media darlings of late 1950’s and 1960’s. Very few horse stories have been able to truly touch the hearts of a nation. Red Pollard & Seabiscuit did in the 1930’s, Harry deLeyer & Snowman did it in the 1950’s and then Ron Turcotte & Secretariat was the last to do it in the 1970’s. HARRY & SNOWMAN will be the first time that Harry’s remarkable and heartfelt life story is told by 85-year-old Harry himself. Creative influences throughout the 70’s in Aspen led to multiple opportunities to explore photography and filmmaking for Karin. Among her mentors were Warren Miller’s ski films that had drawn more participants into the sport of skiing. Environmental and sports passions led her to apprentice for a group of Aspen-based film makers, opening her eyes to view her love of horses, specifically jumpers through the lens. Karin’s film would broaden the viewership, appeal and participation in show jumping in the same way. Forging relationships with Egon Mertz in Malibu California, Gordon Wright, Captain Vladimir Littauer via Fen Kollock, Paul Cronin and Jane Dillon and Gordon Wright, Karin’s interest in horsemanship surpassed even her expectations. Her desire to promote show jumping extended as far as to propose production of a Grand Prix event in Central Park, ultimately assisting in ESPN’s show jumping coverage. She sought to film the 8th Pan American Games in July of 1979, and then later that year she began production of her own one-hour Sports/Entertainment special, JUMPERS. Her long-stored archival footage of JUMPERS became invaluable in the depiction of the feature documentary HARRY & SNOWMAN. Karin knew of Harry’s storied success with Snowman, having followed it from a young age herself. Combined with her high-quality action footage of him in competition, Karin effectively created a time-capsule featuring Harry’s first-person account of the Snowman saga. Offield Farms’ mission is to serve as a significant catalyst for the advancement and promotion of equestrian sport through special events, educational programs, corporate entertainment, media projects and through personal interaction between horse lovers and horses. Visit www.offieldfarms.com now combined with www.lingh.nl and www.breknridgefarms.com for more information about dressage, Lingh and the passion for our equestrian sports. Karin Reid Offield has been involved with horses her entire life. She was born and raised in Aspen, Colorado and began riding at an early age. Her first love was jumpers and equitation and she traveled around the country competing at the highest level of shows. During her junior years she relocated to schools in Arizona and California, enabling her to ride throughout the winter months and also providing her access to top coaching. Among her early mounts was Iron Warrior, who earned many tri-colors at prestigious shows, including Cow Palace, Bakersfield and the Santa Barbara National. Legendary horseman Ronnie Mutch was among Karin’s coaches. With his help, Karin finished in the Top Ten at the AHSA Medal Finals in Harrisburg, Pennsylvania. Throughout her riding career, Karin has always looked for ways to help promote horses to non-riders as well as young children. After stints working in New York and North Carolina, Karin returned to Aspen to run a ranch where she not only rode horses, but also helped organize the youth program. Eventually her love of international competition won out and she returned to the show circuit in Wellington, Florida and began a long association with Carl Knee. During these years Karin competed from Canada to Florida and even galloped racehorses. With her exposure to the best sport in the country, Karin began to think in terms of sports promotion and founded Equestrian Reels, a production company dedicated to equestrian sports. Among their projects was a behind the scenes look at show jumping in the United States. Karin took this interest in promoting equestrian activities further when she co-founded El Rojo Grande Ranch in Sedona, Arizona. This was the culmination of a project that began in college when she designed an equestrian center as a course requirement. El Rojo Grande Ranch was an international-quality equestrian facility that was designed for the community. With a dude string, authentic stagecoaches that were built on the ranch, and facilities for special events, El Rojo Grande Ranch became a model for how a synergistic partnership can be created within and by the local community. Karin developed a variety of projects to encourage children to spend time with horses, including lessons, vaulting and demonstrations. Karin’s own career with horses took a new direction when she became intrigued with the classical traditions of international dressage. With lessons from a local dressage trainer, Karin and a pretty black horse from her dude string advanced through first level at the Arizona Dressage Association shows. 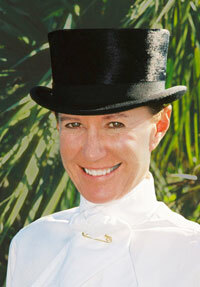 Karin soon committed herself to understanding the intricacies and nuances of dressage. Trainer Michael Etherly came highly recommended from U.S. Olympian Steffen Peters. Michael relocated to Arizona and the rest is history. With Michael’s help Karin progressed steadily up the levels and began competing in California. In addition to her first black trail horse, Karin successfully campaigned several Quarter Horses until she received the warmblood stallion Alla C’zar as a gift. This was the beginning of an impressive string of mounts that have been carefully selected not only for their quality of movement, but their impressive characters. 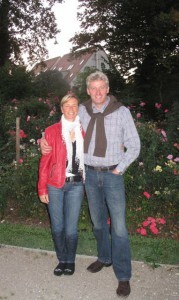 Over the years Karin and Michael expanded their training program to Europe where they have worked with many classical trainers, including Master Egon von Neindorff and Olympic coach Jean Bemelmans. Karin has earned numerous USDF year-end awards from training level to FEI and has won four USDF Regional Championships at the FEI level. Karin has recently expanded her training program to include coaching by six-time Olympian Robert Dover. In 2005, she qualified for the USDF Regional Championships at grand prix and will continue to show Hexagon’s Louisville and Tiamo Trocadero at CDIs on the east coast. Throughout her dressage education Karin has worked to bring the sport to a wider audience, first by hosting dressage demonstrations in Arizona as well as by supporting a variety of educational programs, including the Dressage Foundation’s Advanced Young Riders Olympic Dreams European tour. After selling El Rojo Grande Ranch and moving to Michigan, Karin formed Brek N Ridge Dressage, which was recently rebranded Offield Farms. Sponsorship of the 2005 FEI World Cup Dressage Final, Presented By Offield Farms is simply the next chapter in the story of one woman’s effort to make a difference in the advancement and promotion of the horse sports generally, and now dressage specifically. 2005 also marked the Karin’s CDI debut. CDI is a French term meaning, Concours de Dressage International—international dressage horse show. The CDI division at dressage shows is among the highest international rating by the international governing body of equestrian sport, the FEI. Very few riders in the world compete at the CDI level. With Hexagon’s Louisville, Karin competed at the CDI Ox Ridge Show in August of 2005 and earned a second place in the CDI Grand Prix Freestyle. Her results in 2005 and early 2006 garnered her an invitation to compete at the 2006 USEF National Grand Prix Freestyle Championships. Only the 10 best riders in the country are invited to compete not only for the national title, but also for the chance to represent the United States at the World Cup Final. Karin placed sixth and eighth in the grand prix and the grand prix freestyle, respectively. At the end of 2006 Karin and Louisville were the best in the country in two divisions. They earned the 2006 USDF Adult Amateur Grand Prix Horse of the Year and the 2006 USDF All Breeds Award (KWPN-NA) Adult Amateur Grand Prix Horse of the Year with a score of 65.204%. In November 2006, Karin welcomed superstar Lingh to Offield Farms. The impressive bay stallion has a legion of fans worldwide. In 2005, the charismatic champion wowed American dressage fans with his second place finish at the World Cup Finals in Las Vegas. While Karin has successfully ridden several stallions in her career, she has worked hard to develop a true connection and partnership with Lingh. In late 2007 Karin and Lingh returned to the United States with the goal of competing at the CDIs in Florida. The pair kicked off the Florida season with top five placings in the Grand Prix Special at the Gold Coast Opener, a qualifying event for the Selection Trials for the 2008 Olympic Games in Hong Kong. The duo competed at one other CDI before the close of the Florida circuit. With the goal of gaining additional experience and exposure, Karin and Lingh returned to the Netherlands to ride at Anky’s. As a young horse with Edward Gal in the saddle, Lingh learned to piaffe and passage under Anky’s guidance. This long history has proven invaluable to Karin and Lingh. “When I arrived in Sweden my time with Lingh and riding was what I looked forward to. I was finally back in my saddle and learning. I spent my time with a young 6 year old mare, taking lessons and learning to longline with teacher Bo Jena and working with Lingh, spending time with him. I love him ! We had a great winter, traveling back and forth a couple times from America. For the winter of 2010 I spent it mainly in my hometown in Aspen, Colorado. Since both my parents passed away, I felt it was important that I return home and establish my friendships with my peers and their families. My second week on the ski mountain I was hit by a fellow skier and I spent the remaining months in Aspen going to physical therapy and healing a crushed calf muscle. The experience proved to me that I had been right about not skiing during my Olympic journey years with Lingh….too risky ! In December 2010 I headed to Sweden and the excitement for this trip was in Stockholm at the International Show st the Globe. Bo Jena and Lingh were incredible.Lingh Longlining at Globlen Horse Show, Stockholm, Sweden with Bo Jena My time spent at Flyinge this winter was extra special too. Meeting friends and colleagues and many adventures. The Christmas Flyinge Gala was superb ! Lingh the King ! Thank you to Matts, Mattias, Karl-Henrik, and all the beautiful Swedish girlfriends that work at Flyinge and take care of Lingh…..
Lingh at Christmas in Flyinge. Loved ! In early January 2011, I received a phone call from Europe from a small town south of Stuttgart. On the telephone was Thomas Casper, of Gestut Birkhof, a well respected breeder in Southern Germany. He asked me if I would consider bringing Lingh to Germany from Sweden. Many reasons led me to the decision to say yes and within 2 weeks, Lingh was on his way. I have now traveled several times to Gestut Birkhof and am satisfied that my breeding goals are being met. Now retired from breeding, Lingh is stabled with a fine family and we are all happy. To keep up with the adventures of Lingh, dressage and anything equestrian stay tuned to my blog “New News” on the website – click here http://www.offieldfarms.com/OF/newnews and read about the subjects I like to share. Thank you Emanuel Runte for organizing such a great show !